Mediation allows parties to a dispute to reach a solution that is satisfactory to all those involved, with the assistance of a third party neutral – an impartial Mediator. A Mediator does not act as a judge; he or she does not issue a ruling on the dispute in question. The Mediator acts as a catalyst, helping the parties in dispute communicate effectively and seek a mutually acceptable solution to their dispute. The Mediator monitors the mediation process at all times, making sure it advances smoothly and in compliance with any legal requirements. Following Directive 2008/52/EC, EU Member States have each introduced domestic rules on mediation in civil and commercial matters. In Greece, the relevant matters are regulated under Greek Law No. 3898/2010 and Law No. 4512/2018, applicable to civil and commercial disputes to the extent that the relevant rights and obligations are “at the parties’ disposal”, i.e. where parties are free to make arrangements on their dispute and the court is not required to intervene. Under the Greek mediation law, parties are required to attend mediation sessions with their legal counsel, except from consumer disputes or small claims (up to Euro 5.000), where the presence of a legal counsel is optional. Upon filing with the secretariat of the competent court (court of the district where the dispute can be brought before), the final mediation agreement is binding (enforceable title) and either party may issue enforcement proceedings in case of non-compliance on the part of the other. The parties may jointly or independently ask EODID Athens to make arrangements for their agreement to be filed with the court. Family matters, particularly the amount of allowances, child custody etc. The beneficiaries of legal aid are exempt from mandatory mediation. A mediator will not impose a solution, but will rather act as a catalyst to help parties reach a solution themselves through adequate communication channels. On the other hand, an arbitrator will, in fact, hear the case and examine evidence submitted by the parties, with a view to delivering a judgment that is binding upon the parties. For further information on Arbitration please press here. Under the current system of administration of justice in civil and commercial matters, at least 610 days are needed from the filing of a claim in Greece until the case is heard at first instance («Contribution towards an Effective Justice», Society on Judicial Studies, Nomiki Bibliothiki Publishing House 2016). This number does not even include possible subsequent delays leading the time needed for a final judgment rocket to several additional hundreds of days, which are critical for maintaining a commercial collaboration or ensuring the operation of a business. Mediation, a process used for decades in the USA, the UK and Australia for the amicable, out-of-court resolution of most civil and commercial disputes, with an over 75% success rate, emerges as an alternative to these long waiting periods. 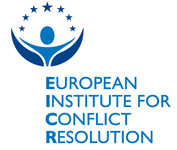 In recent years, mediation has recorded intense growth rates in the EU (particularly in Italy, France and Germany), slowly earning the trust and respect of the legal and business community, as a result of the significant advantages it offers. Disputes and conflicts are dealt with quickly, with no delays, within an average period of 5 up to 75 days from the date a mediation request is filed to the signature of a final, mutually beneficial resolution agreement. Overall, mediation costs a lot less than litigating the same matters would, thus allowing you to save money on your dispute resolution. Under the Greek mediation law, participation of the parties’ lawyers in the mediation sessions is mandatory. Under other applicable laws, legal counsels may participate upon agreement of the parties and the mediator, who makes sure that the process is configured to the benefit of the parties at all times. If you opt for mediation for resolution of your dispute, while proceedings are pending or before starting legal proceedings, you preserve your right to withdraw from the mediation process at any time; you would then opt for or return to the litigation track, in order to exercise your inalienable right to an effective remedy. Under the Greek mediation law, and in accordance with the relevant EU norms (Directive 2008/52/EC), when the parties opt for mediation the limitation and prescription periods for the whole duration of the mediation process. Without prejudice to the applicable mediation law, and unless otherwise agreed, all those participating in the mediation process are bound by a confidentiality clause. Furthermore, the Mediator is not allowed to disclose any information shared with him or her in a caucus session with any party, unless that party expressly allowed the Mediator to do so. Mediation entails an improvement in communication and therefore helps restore commercial and/or family-personal relationships between the parties. Under the Greek mediation law, the mediation agreement drafted upon conclusion of the mediation process may be filed with the Secretariat of the competent Court of First Instance, at the request of either party; upon filing, the agreement constitutes an enforceable title. Similar provisions are included in the national mediation laws of other EU Member States. The Mediation Rules of EODID Athens are the outcome of a collaboration between competent Legal Professionals and experienced Mediators, who have each contributed their expertise with a view to creating a set of rules that fully complies with the domestic and European rules and best practices on mediation. 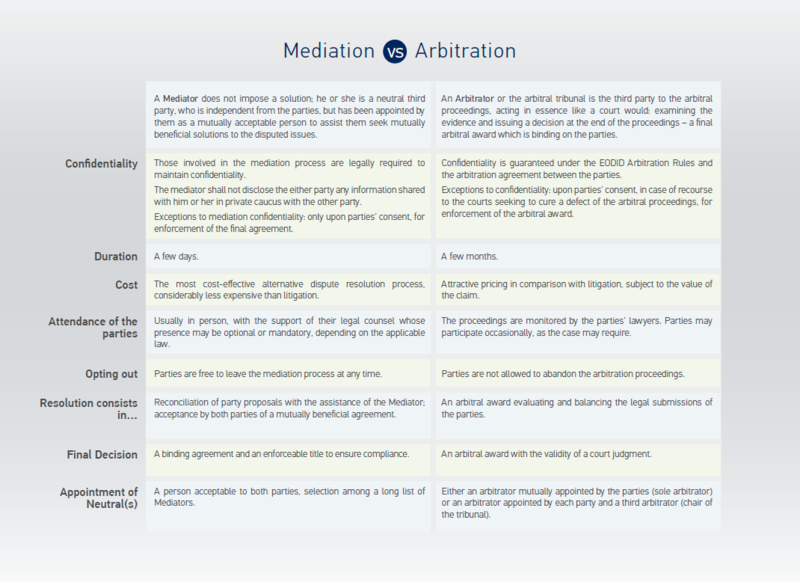 The EODID Mediation Rules (complemented by the provisions of Greek Law No. 3898/2010 and Law No. 4512/2018 for disputes where Greek law is the law applicable to the mediation process) ensure the highest quality of mediation services provided under the auspices of EODID Athens, matching the real needs and current potential of the legal and business community. Mediators with experience and expertise in the shipping industry, the energy sector etc. See the list of EODID Mediators to select a mediator for your case or contact us to request a recommendation of mediators whose profile matches the needs of your case. Adequately configured rooms and spaces with modern infrastructure. Contact us if you are interested in using Mediation to settle your dispute. Contact us to explore the support services available for Mediators. Coffee breaks – light meals. Call us (+30 210 3678910) or e-mail us or contact us directly through our website contact form to submit your Mediation Request to EODID Athens. Gather the necessary documentation (e.g. Mediation Briefs possibly required by the Mediator). In the event that your case is not eligible for mediation, EODID Athens can assist you in choosing another ADR process that may be more suitable to the needs and circumstances of your case. Once it is time for the mediation session, the mediation process usually concludes within 1 day, although additional sessions are available if needed. The Mediator shapes the process in collaboration with the parties concerned. The Mediator helps clarify the issues on the agenda and assists the parties in seeking mutually beneficial solutions that are acceptable to all those involved. Making all necessary arrangements for mediation housing & accommodation. Providing secretarial and administrative support where necessary. Under the guidance and supervision of the parties’ lawyers, a final mediation agreement is drafted. Agreements reached by the parties in mediation with regard to any aspect of their dispute is included in the mediation agreement. Throughout this stage, EODID Athens provides, if the parties so request, for filing the mediation agreement with the competent court, thus ensuring that parties are in possession of an enforceable title (under Greek Law No. 3898/2010 and Law No. 4512/2018). Following conclusion of the mediation process, EODID Athens remains at your disposal, taking all necessary follow up steps, including soliciting information on compliance with the mediation agreement and recommending the adequate route for resolution of any dispute arising with regard to enforcement of the agreement. Participate in good faith and a genuine will to collaborate. Choose a legal counsel who is familiar with the mediation process and possesses mediation advocacy skills. Identify which parts of your dispute matter the most to you; set priorities. Try to evaluate which parts of the disputes are more important to your dispute counterparty; explore them in advance and be prepared to ask questions. Make sure you have the authority to make final decisions as regards the dispute in question; if applicable, arrange in advance for the necessary authorizations. When the mediator invites you to brainstorm solutions, be willing to also explore possibilities that you would probably discard at first glance. When the mediator asks the other party to brainstorm solutions, listen carefully and control your urge to discard any proposals before exploring whether they could work for you. Ask your lawyer for guidance whenever you feel that his or her advice would help you. Αsk the mediator for a caucus if there is something you would like to discuss in private before discussing it with the other party. Think of ways to use the mediation process as an opportunity to explore a possible renewal or improved configuration of your collaboration with the other party on a more solid basis. Discuss with the mediator any doubts or reluctance you may have with regard to a particular clause of the final mediation agreement before signing and committing to its provisions. Make sure that you provide the mediator with all the necessary information requested during the preparation stage, in order to help him or her better prepare the mediation session. Request further information and clarifications from the EODID staff and the mediator, in order to be absolutely familiar with what your client needs from you at all stages of the mediation process. Ensure that the people whose participation is key to resolution of the dispute are available to participate. Make sure that your client has the authority to make final decisions with regard to the subject-matter of the dispute, without needing the approval or authorization of third parties. Encourage your client to actively participate in the mediation process, helping him or her prepare in advance if necessary, and you intervene where necessary to protect your client’s interests. Arrange your schedule in order to have the day scheduled for mediation available in order to participate in the mediation process (a mediation session may last a full day!). Actively participate in drafting the final mediation agreement, ensuring that the various solutions agreed by the parties are duly worded to create the corresponding contractual rights and obligations. Doublecheck that your client has fully understood the terms of the final mediation agreement before signing that agreement. The cost of mediation depends on the value of the claim, the duration of the mediation session and the fee of the mediator chosen by the parties (different rates apply to different groups of mediators – group I or group II as per Annex I of the EODID Mediation Rules). This cost comprises a fee for mediation services and the cost of housing & accommodation (plus VAT). The relevant amount is paid per party to the dispute (interested party and their legal counsel). Read more about the EODID Athens mediation costs & fees policy (Annex III to the Mediation Rules) and contact us to be informed of the total cost of mediation for resolution of your dispute.